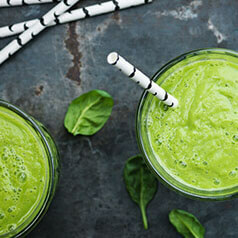 Blended spinach and kale? Wouldn't be my first choice for breakfast either but combined with the natural sweetness of banana and berries, this combination is bursting with inflammation fighting antioxidants, immune boosting vitamins, fiber to keep you full, and protein to keep you going until your next meal. Tip: Personally, I prefer spinach because it blends better than kale but look for baby kale or use bags of juicing greens available in the salad section at your supermarket.